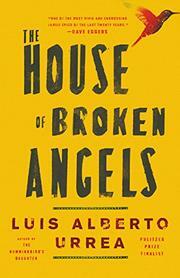 “Big Angel was late to his own mother’s funeral.” Yes, readers, that’s the opening sentence of Luis Alberto Urrea’s latest novel. He follows it a few sentences later with another gem: “Mexicans don’t make these kinds of mistakes, he told himself.” Urrea, who was born in Tijuana to a Mexican father and an American mother, pens a poignant, often-times humorous, and always evocative book whose genesis came when he shared the story of the death of his older brother with writer Jim Harrison when he found himself seated next to him at a dinner. In a recent interview with “Time” magazine, Urrea remembered, “Harrison said, “Sometimes God hands you a novel. You have to write it.” Urrea thought to himself, “Marching orders from Jim Harrison–this is good stuff. A kid from Tijuana doesn’t get that very often.” Thankfully, for readers, the kid from Tijuana listened as this over-the-top, wonder of a novel is a love poem to the Mexican-American family that transcends ethnic boundaries to become the universal story of all family relationships. Big Angel is about to celebrate his seventieth birthday and because he knows he’s dying, he’s planned a massive celebration. His 100-year-old mother, América, dies the week prior so Big Angel sets her funeral for the day before his scheduled celebration as the family already will be in San Diego for the party. Thus, the novel takes place over the two days of the funeral and the birthday party with most of the large de la Cruz clan gathering to mourn the matriarch and celebrate what promises to be Big Angel’s last birthday. Flashbacks reveal Big Angel’s life in Mexico in the 1960s, his love of his wife Perla, the quirks, foibles, and joys of his siblings, children, and extended family while making this reader feel that she, too, was a member of the jubilant clan. Much of the tale is seen through the eyes of Little Angel, Big Angel’s much younger, half-American, half-brother who seems removed from the family in more than just distance. Urrea’s own brother’s death shortly after their mother died inspired the tale and infuses it with realistic, emotional gravitas that transcends pure imagination. Urrea’s unmatched ability to weave laugh-out-loud humor with universal truth makes the novel soar as in the description of the party. “Food was appearing all around them. People came through bearing aluminum tubs of grub. La Gloriosa and Lupita and Minnie and Perla had arranged for platoons of barrio ladies and their husbands to appear with party supplies. Little Angel was thwarted in his hopeless search for homemade Mexican food. In his mind, chicken mole and pots of simmering frijoles and chiles rellenos were to be displayed in pornographic lushness. But the reality of the day was folding tables groaning with pizzas, Chinese food, hot dogs, potato salad, and a huge industrial party pan of spaghetti. Somebody was allegedly on the way with a hundred pieces of KFC. He noted Uncle Jimbo at his table with a paper plate heaped with noodles and buffalo wings. Somehow he had acquired bottles of mead. Urrea’s sentences also allow the characters to reveal themselves without his telling us who they are: “Perla sat at a table on the patio and rubbed her aching knees. Her small flock of doggies was scuttling around like animated empanadas on meth. “Ay, qué perritos,” she said. They were Chiweenies. Chihuahua/wiener-dog mixes. La Minnie called them “naked mole rats” since she took her kids to the zoo often and knew these things. Minnie had even been to the art museum. Overall, it is Urrea’s celebration of love: love of life and love of family that makes this novel one that will leave the reader satisfied even through the tears. “Big Angel sighed. Rubbed his face. Thought about how much he’d miss rubbing his face. Everything was precious to him suddenly. Sighing. What a wonderful thing it was to sigh. Geraniums. Why did he have to leave geraniums behind.”. . .
I’ve discarded over a dozen quotes that I wanted to include in this review so dear readers, please buy this book so you can inhale and savor them yourself. Summing it Up: The House of Broken Angels is an exuberant, joy-filled family saga that celebrates what it means to love, to grieve, and to be a family in today’s USA. It’s also a love letter to the Mexican-American family that makes the reader feel -- if only for just a few hours – that they too belong. Note: Urrea is on a long book tour throughout the US. If you are anywhere near one of his stops, take the time to hear him read and speak. I’ve heard hundreds of authors and he’s one of the best, if not the very best, reader there is. That said, you may want to listen to the audio version of the novel as Urrea reads it himself. I read the novel in print as I wanted to savor his words on the page, but I may still listen to him read it as I know it will be a magnificent rendition.